For visitors and tenants, custom parking passes ensure your valuable parking spaces are not being used without authorization. 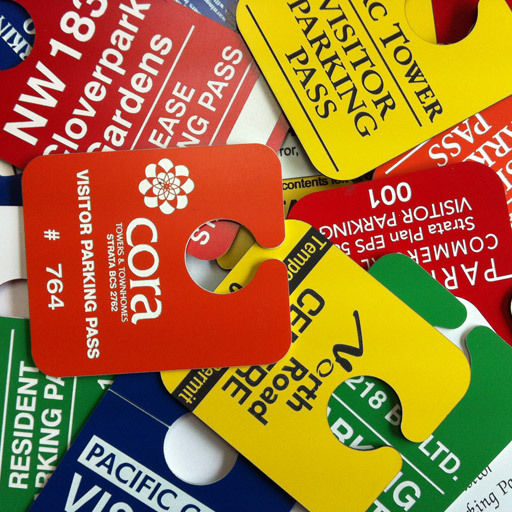 Parking passes can also be numbered to help identify specific tenants or parking spaces. We offer both Lamacoid hang tags and static cling windshield parking passes. Step Five: Update your passes with annual stickers as needed, any color or shape available. Static cling decals can be any size, shape and color you need. They cling onto smooth surface and can be removed, re-positioned and re-applied easily. Static cling decals do not have adhesives, there is no residue left after removal and able to last for years. If you couldn’t find what you need, please feel free to contact us for a custom design.